"Replacing du Pont with the new DowDuPont allows the Dow Jones Industrial Average to maintain its exposure to the Materials sector....The change won’t cause any disruption in the level of the index. The divisor used to calculate the index from the component’s prices on their respective home exchanges will be changed prior to the opening on September 1. This procedure prevents any distortion in the index’s reflection of the portion of the U.S. stock market it is designed to measure." 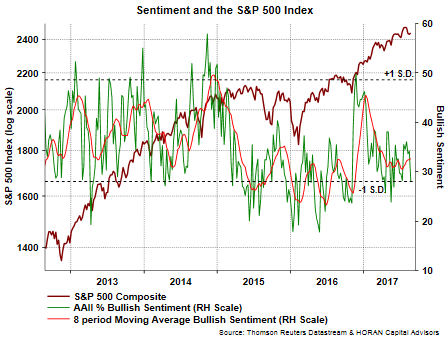 This week's AAII Sentiment Survey reported a 6.1% decline in bullish investor sentiment to 28.1%. The bullish sentiment level is now near one standard deviation below the long term average. Nearly all of the decline in the bullish sentiment showed up in the bearish number which increased 5.5%. The bull/bear spread is now -10.4 percentage points. It has been about two weeks and market sentiment seems to have quickly turned decidedly bearish and the S&P 500 Index is down only 2.2% from its high. I will not list all the bearish commentary over the last few days, but we even pushed out some thoughts this weekend on our Twitter account (@HORANCapitalAdv) that leaned a little bearish. A couple of reasons for the increased bearishness might be the fact the market has gone over a year without a pullback of more than 5% and stock valuations do appear elevated on an absolute basis. Lastly, with the increase in technical and computerized trading, readers should know the S&P 500 Index acquired a significant target price that was triggered over four years ago and was formed out of a 16 year trading range for the market. Once significant levels like this are reached, it is not uncommon for the market to at least consolidate gains. It seems nearly every company reporting earnings now references a strategy to deal with Amazon (AMZN) due to Amazon's command of e-commerce sales. Beyond the simple delivery of packages and hard goods, AMZN is moving into many other areas like grocery, air transportation, etc. I discussed this in a post a few months ago. In that post I highlighted the profitability of Amazon's cloud business (AWS) and the company using AWS profits to fund growth in other industries. Yesterday, the U.S. Census Bureau reported quarterly retail e-commerce sales for the second quarter of 2017. Not a surprise to many now, e-commerce sales continue to grow at a high rate, i.e., up 16.2% on a year over year basis for Q2. Traditional brick and mortar sales were up a small 2.9% year over year. 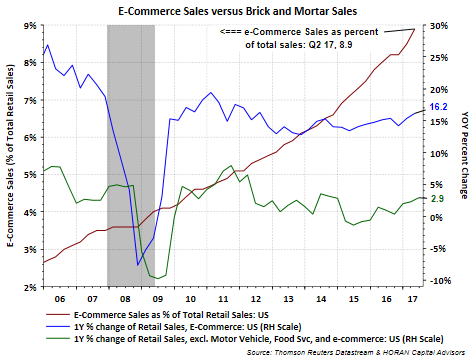 The other notable highlight from the Census Bureau report, e-commerce sales now account for 8.9% of total retail sales. This is nearly three times larger than ten years ago. One economic conundrum has been the sub-par growth rate in average hourly earnings in spite of what appears to be an economy operating at full employment. In a fully employed economic environment, wages generally see fairly strong upside pressure and this becomes a concern with the Federal Reserve due to the upward pressure placed on the inflation rate. As the below chart does show, average hourly wages have grown at about a 2% annual rate since the end of the financial crisis. Prior to the onset of the last recession, wage growth was in the range of 3% to 4%. From a positive perspective though, wages have been growing faster than the rate of inflation for most of the last four years. 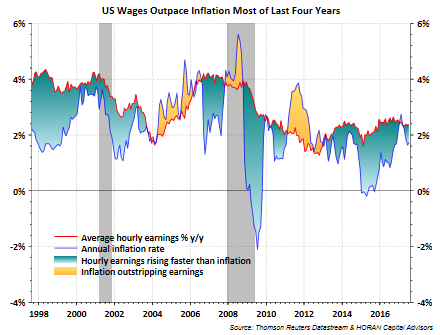 Additionally, the differential wage growth and inflation in this cycle is on par with prior economic expansions. The equity market has gone over a year without a pullback of at least 5% or more. The last 5% decline occurred in mid-June 2016 when, over a two week period, the market fell 5.5%. Even in the run up to the election last year, the equity market did not close down over 5%. This lack of volatility is showing up in popular volatility measures like the VIX, but the VIX may not be a good measure of expected future volatility. Also, this lower level of volatility has some strategists suggesting investor's have become to complacent about the equity market and have willingly taken on more equity exposure as a result. A recent post by Dr. Ed Yardeni, Ph.D., and he puts out some great research, noted individual investors may have become too optimistic as well. 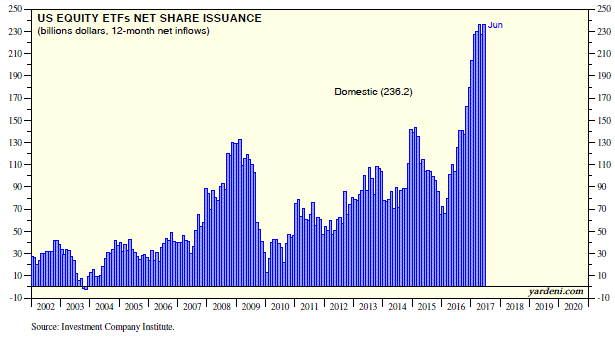 In that post, Investors Hearing Call of the Wild, he included the below chart of U.S. equity ETF flows. 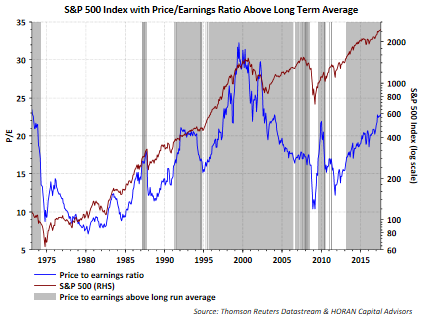 One can cite any number of stock valuation measures and conclude U.S. equities look expensive or are at least trading above their long term average valuation measures. In this environment one might conclude stocks are priced for perfection with little margin for error. Of course this might certainly be the case, but is this an uncommon position for the equity market? As the shaded areas in the below chart show, investors would have had a difficult time buying or holding onto stocks at valuation levels that were below their long term average valuation since the early 1990s. A year ago dividend paying stocks were significantly outperforming the non payers in the S&P 500 Index and the S&P 500 Index itself. If investors were chasing performance back then and loading up on the payers, today they would be disappointed. Below is a chart of the year to date performance of two dividend paying exchange traded funds, SPDR Dividend ETF (SDY) and iShares Select Dividend ETF (DVY). 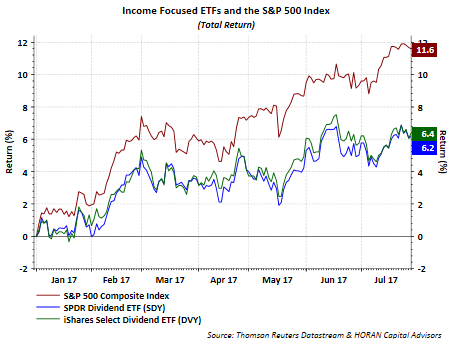 The return of the dividend focused ETFs is nearly half that of the S&P 500 Index. The return difference is similar for one year. My year ago post contains some details on both ETFs.